As a track-based DAW (Digital Audio Workstation, i.e. a MIDI and audio recorder/editor) guy, my first look at Ableton Live elicited from me a rather long-winded "huh?" However, befuddlement soon gave way to stark admiration for the program's interface and abilities. I wrote the above paragraph five years ago. But while I admired Ableton, I kept going back to the DAWs with workflows I was familiar with such as Studio One, Cubase, Sonar, and even Mulab, even though they all irritated me in one way or another. I could just never get over the hump of Ableton's unfamiliarity. A real shame, because now that I’m fully on board, for the first time in my recording life I’m free of DAW-envy. While I have a few nits with Ableton, I’m no longer tempted by others. At least for the creative stage. Live's Arrangement mode is for both recording and arranging clips into songs. Why? Three reasons: workflow, simplicity, and a resizable interface. Ableton Live, now at version 9.6, is by far the simplest DAW to navigate and record with--once you know what you're doing. It's not necessarily intuitive to those coming from other DAWs, which is why it took me so long to get with the program. However, the program's methods make so much sense once I find them, I never have to struggle to remember where something is or how to use it. When I say simplicity, I'm not saying Ableton Live lacks sophistication. It has that in spades. But, despite the myriad of feature requests you find in the Ableton forums, they've kept things simple, and relegated what might be niche features to Max for Live. Max is a framework/interface to the inner workings of Live that allows the development of third-party plug-ins and utilities. Live's interface is re-sizable because it’s rendered using drawing commands, or simple stretchable bitmaps, not “realistic”, static-sized bitmaps. Switching to an Ultra UHD display? Open preferences and set the interface to 150% or even 200%. The resized text and controls keeps things legible where smaller, constant-size bitmaps disappear into obscurity. My older eyes truly appreciate this. To be fair, most other programs are now adding support for higher-resolution displays. Live's "Session" view features a mixing board and the ability to launch clips for live performance. 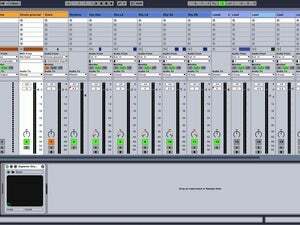 When I originally reviewed Ableton Live in 2010, I talked a lot about the paned interface, but other programs have largely caught up with what was at the time, a rather unique approach. No one, however, has caught up with Live’s keep-it-minimal and straightforward controls. Wasting time navigating about because of tiny icons and visual clutter is my number one complaint about several DAWs. Another thing I love about Ableton, is that it’s not modal. That is, you don’t select specific tools to enter notes, delete them, split them, etc. though there is a draw mode if you want it. Modal, which works well in art programs where there are huge numbers of tools, has always driven me nuts in music programs. Given any particular context, there are only a very few things you might want to do with a note, part, or clip, so Ableton puts the commands in a context menu and/or assigns them to a keystroke. 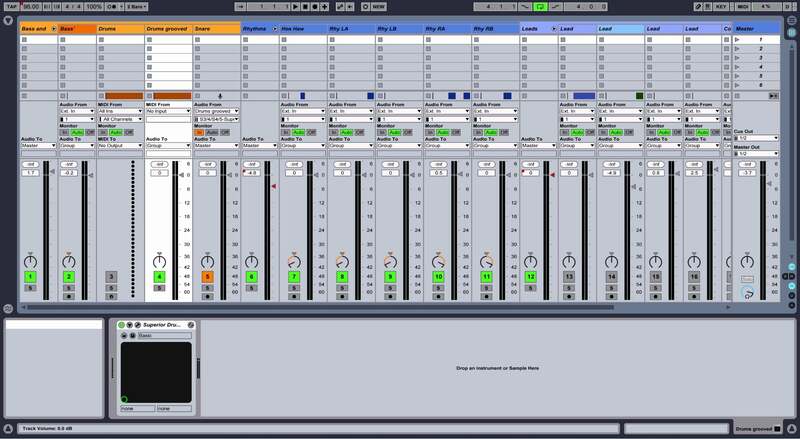 Ableton Live’s appeal for many users is the step-based, part-oriented (parts are called "clips" in Ableton vernacular) arranger that makes electronic live performance, creation, and improvisation very easy. But it’s also very good at track-based recording, which is what I do. There are a couple of foibles, but for the solo artist, the ease of recording more than makes up for them. Coming from other DAWs, I kept saying “Why doesn’t Live do this?” only to discover there was a different, and often better way. Though no longer unique among DAWs, another outstanding feature of Ableton Live is its warping, or manipulating the rhythm, tempo, and pitch of audio (or MIDI). This can be used for anything from matching tempos of dance songs while DJ’ing at a night club, to fixing tempo problems in a recorded performance, to breathing life into robotic computer music by applying human-like grooves. Ableton can also extract grooves from existing audio material. If you want that feel from your favorite recording, you can have it. Ableton Live supports VST instruments and plug-ins; the MIDI editing is excellent, and the built-in instruments, sounds, and effects are top-notch. Automation of everything is seamlessly integrated, and the included sampler instrument imports a variety of formats. 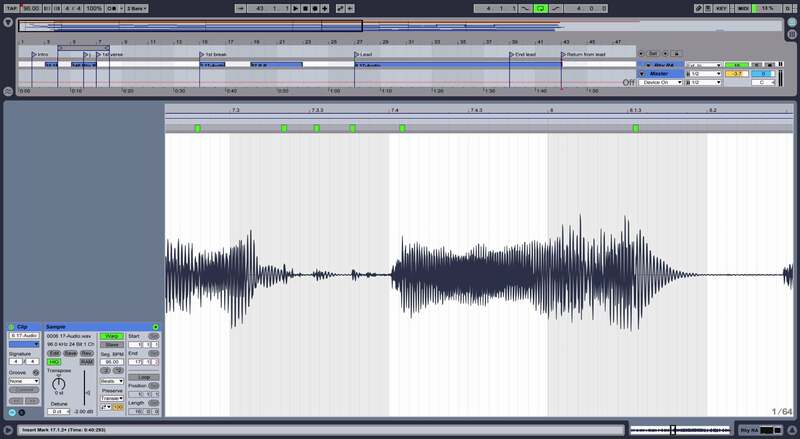 One area where Ableton might still be considered lacking is in traditional destructive audio editing. You can do a lot with the parts derived from audio files, but if you need to do something such as strip the silence or delete parts of the original file, you must send it to an external editor. I use the free Ocenaudio, Izotope RX, and occasionally Melodyne. I wish you could choose from several programs from within Live, but it only lets you define one. It does however, show you exactly where the file is on disk so you can open others on your own without too much hassle. The green tags at the top of the waveform are warp markers that may be dragged about to change the timing of audio events automatically detected as transients. You can also manually insert them. 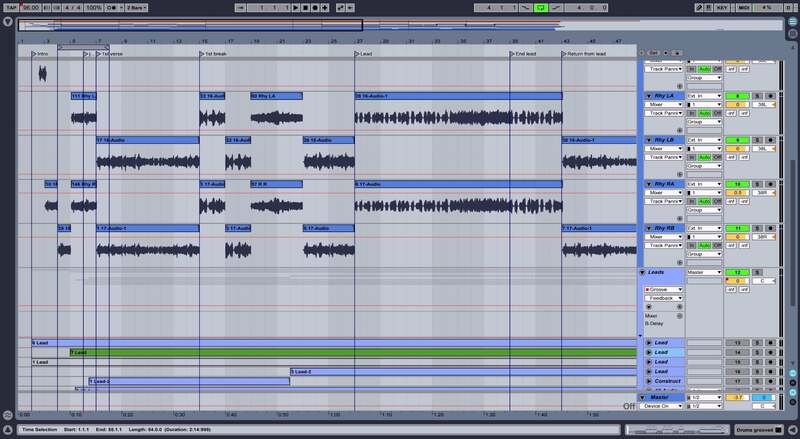 Ableton Live comes in three basic flavors: Suite ($749), which offers a lot more of everything including sounds, effects, and instruments; Standard ($449), with its basic set of sounds and effects; and Intro ($99) which is limited to 16 tracks and has far fewer instruments. To be honest, I could probably make do with Intro, except it lacks the "Complex" and "Complex Pro" audio warping mode that I sometimes require to fix recorded instrument audio tracks. Ableton also markets a $799 dedicated controller for Live called Push (now Push 2), as well as the $199 Max for Live. There are also scads of content packs for users who like to shape and manipulate more than record. Ableton didn't offer a major update for several years, starting right after I previously reviewed it in 2009. But the company has again found its mojo and new releases are arriving every few months. More importantly, they are arriving without screwing up the program’s stellar usability or adding needless complexity. Words can't do this DAW justice. The only way to truly appreciate its abilities and easy workflow is to use it. But the learning curve is steep, and you might have to set aside the prejudice that advanced capabilities require a complex bitmapped interface. But Ableton has torn me away form my old standbys. Anyone who’s spent the countless hours that it takes to become facile with a DAW knows that is no mean feat. And for live performance, it still really has no peers. Note: This article was heavily edited on 02/22/16 to cover six years worth of development and changes in the product. Ableton Live's clever interface and integrated audio time, pitch, and tempo manipulation make it a powerful creative, recording and editing tool. The scalable interface, though perhaps a little long in the tooth appearance-wise, remains refreshingly simple and straightforward. The suite version comes with thousands of samples, and a plethora of virtual instruments and FX. But the heart of the program is its flexible clip launcher which allows DJs and electronic dance mavens to queue up and play material as they see fit. They don't call it Live for nothing. On the negative side, the program doesn't export projects (only tracks) as MIDI files or anything else, and there's no support for VST3 plugins. The mixing section is also a bit primitive and the company has spent much of the last few years on its Push software. Still, if you don't see a feature you're used to, read the docs or visit a forum. Odds are there's a better, quicker way to do what you want to do in Ableton. It really is the quickest way to get your ideas down in a palatable form.